A nursing assistant is provides personal care and assistance under the supervision of a Licensed Vocational Nurse or a Registered Nurse. The duties performed are determined by the state’s guidelines and the facility’s policies. Nurse aide programs help students gain the knowledge and develop competency and confidence to care for patients. Upon satisfactory completion of the program, the student will receive a Certificate of Completion that confirms eligibility to take the written and skills exam that is required by the State of California Department of Health Services to be added to the California Nurse Aide Registry. There’s a huge demand for Certified Nursing Assistants in throughout the state of California. U.S. Bureau of Labor Statistics lists the profession among the fastest-growing occupations with a projected growth rate of 17 percent from 2014 to 2024. CNAs may use their training and experience to enroll a licensed practical or registered nursing program and enjoy an exciting and rewarding career for many years to come. The CNA program at Mt. SAC is approved by the State of California, Health & Human Services, Department of Public Health, Licensing & Certification Section. The curriculum conforms to the state’s requirements for preparing adults to provide direct care in long-term care facilities. Graduates will be eligible to take the state exam to become Certified Nursing Assistants and work as entry-level providers of care in a long-term care facility. They will also have the foundation preparation that will increase their chances of admission to a licensed practical nurse or registered nurse program. Course content will include anatomy and physiology, basic nursing skills, personal care and grooming, feeding and nutrition, fluid intake and output, patient rights and independence, safety and emergency procedures, and infection control. Students will also have the opportunity to participate in a clinical rotation to provide direct care under the supervision of a licensed nurse. The duration of the program is 11 weeks. The program is offered in the Fall or Spring semesters. School officials will process the state application and administer the NATAP test to graduates. Same day results will be available for the written and manual skills examination. The nursing assistant training program at Windsor School of Nursing meets the requirements of the California Department of Health for training adults for a career as a CNA. The curriculum includes classroom and clinical instruction to prepare students for success on the Written and Skills components of the Nurse Aide Exam. Course content includes infection control, communication and interpersonal skills, safety and emergency procedures, resident independence and rights, personal care skills, mental health, basic nursing skills, care of the cognitively impair, and vital signs. The entire program covers 160 clock hours in 20 days. A total of 105 hours will require participation in a clinical experience at a long-term care facility. Classes meet Monday through Friday. In addition to assisting students with the application for the State Board Examination, Windsor will also conduct a review session to prepare students for success. Be able to bend, twist, lift at least 50lbs. and be free from communicable diseases. Tuition costs $1,500 plus $150 for registration. Hacienda La Puente prepares adults for employment in the fast-paced world of health. Graduates are eligible to take the California State Exam for Nurse Aides to become a CNA and work in a long-term care facility. Students learn resident care, vital signs, patient transfers, emergency care, rehabilitation, hospice care, communication techniques, and laws and ethics. Interested persons must attend Appraisal Testing and complete the Caregiver Certification Course as a prerequisite. The Caregiver Certification covers training in client rights, ethics, emergency first aid, personal care, bathing, toileting, and elder abuse. Students learn how to respect patients’ rights to privacy and dignity. 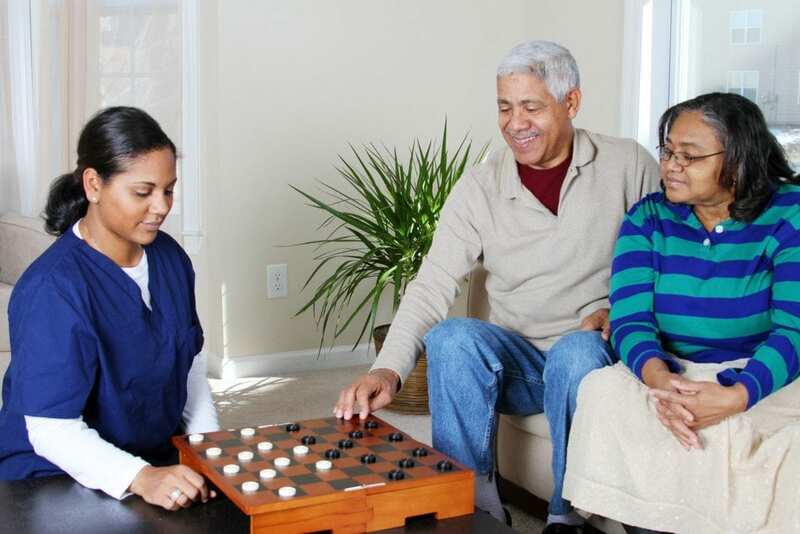 The Caregiver course covers a total of 70 hours. The cost of $214 and includes registration, Heartsaver card, and insurance. The cost of the CNA program (480 hours) is $1,235 and includes registration, ID badge, book, and uniform. Students must provide white shoes, BP cuff, stethoscope, watch with second hand, state competency fee, 2-step PPD, and basic physical exam. The CNA program at Azusa Adult School helps students develop the skills, knowledge, and compassion to help those in need. Graduates will recognize the emotional and physical needs of patients and provide compassionate care to support recovery. The curriculum includes classroom instruction combined with valuable hands-on training in a long-term care facility where students are exposed to real-life challenges in the workplace. The duration of the program is 12 weeks. Classes meet Monday through Thursday from 8:30 am to 12:45 pm and Friday from 8:30 am to 12:30 pm. Interested persons must attend a mandatory pre-admission orientation and complete a California DHS283B form. A photo ID and social security card are needed to complete the form. During the orientation, a facilitator will cover the program in detail and administer an English proficiency exam. Graduates are eligible to take the state exam to become a Certified Nursing Assistant.